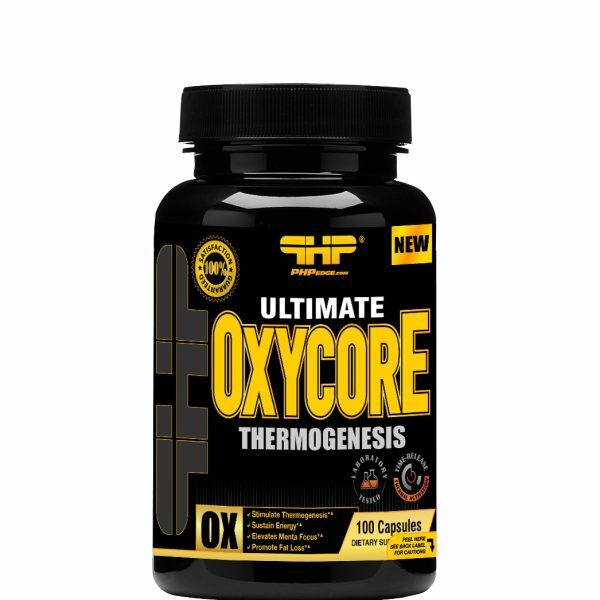 OXYCORE ® is engineered by PHP® R&D research team to provide brut, effective energy and training focus support , with cutting edge micro nutrients. With the Multi-Phase Researched Technologies! OTHER INGREDIENTS: Capsule (gelatin, purified water), microcrystalline cellulose, magnesium stearate (vegetable source), silica, FD&C Yellow No.5, FD&C Yellow No.6, titanium dioxide. DIRECTIONS: To assess your tolerance, Start off for the first 2 days, with only 1 capsule daily. On days 3 and 4, take 1 capsule twice daily. On day 5 and beyond, take 2 capsules twice daily. Best at 30 to 60 minutes before your two largest meals. For continued gains, we recommend no more than 8 weeks of continual use then a 4 week off period in order to prevent any down regulation combined with diet and training. DO NOT COMBINE WITH OTHER SOURCES OF CAFFEINE OR STIMULANTS. Use only as directed. Improper use of this product will not improve results and is not advised. Read the entire label before use and follow directions provided. Drink lots of water daily for general good health. As with any dietary product, in order to obtain the desired benefits, this product should be used in conjunction with a well-balanced diet and exercise program. CAUTION: Not intended for children and pregnant or breastfeeding women. People with health conditions should consult a healthcare practitioner before consuming this product. Do not use if you have had a heart attack/myocardial infarction. Consult a health care practitioner prior to use if you are taking lithium or if you have high blood pressure, glaucoma, and/or detrusor instability (overactive bladder syndrome). Consult a healthcare practitioner if your cardiovascular condition worsens. Do not consume if you are taking medication for cardiovascular diseases, erectile dysfunction, blood thinners, decongestant-containing cold preparations (i.e. phenylephrine or pseudoephedrine), products containing ephedra or ephedrine, or other natural health products (e.g. bitter orange extract, octopamine) or medications, which increase blood pressure. This product is not intended as a substitute for sleep. Ensure to drink enough fluid before, during, and after exercise. Consult a healthcare practitioner prior to use if you have a renal/kidney disease or if you are following a low protein diet or if you suffer from a cardiovascular disease and are attempting an increase in physical activity. May result in weight gain. Consult a healthcare practitioner prior to use if you have gyrate atrophy of the choroid and retina or If you are diagnosed with hyperornithinaemia hyperammonaemia homocitrullinuria syndrome. May cause a flushing, tingling and/or prickling sensation of the skin, in which case, reduce the dose. Caffeine has been shown to reduce blood flow to the heart muscle during exercise which might lead to cardiovascular complications such as chest pain and irregular heartbeat even in healthy individuals. If those symptoms occur discontinue use and consult a healthcare practitioner. Hypersensitivity/allergy is known to occur, in which case, discontinue use. Caffeine may cause anxiety, tachycardia (rapid heart rate), palpitations, insomnia, restlessness, nervousness, tremor and headache. Some people may experience gastrointestinal discomfort (such as diarrhea). Do not use if security seal is broken. Keep in a cool and dry place, away from children. *When combined with a proper exercise and nutrition program. Statements based on independent 3rd party double blinded placebo controlled in-vivo research.